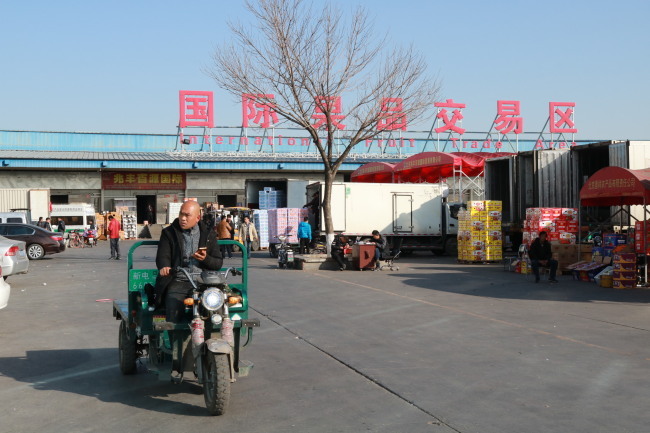 The distributor, located some 10 kilometers south of downtown Beijing and built on 1.12 square kilometers of floor space, traded 2.55 million tons of farm products worth 72.2 billion yuan ($10.9 billion) in 2016, accounting for some 80 percent of agricultural supplies to China‘s capital city. The wholesale market‘s auction system in pricing vegetables, fruits, meat, eggs and marine products, have helped secure farmers’ profit, by demanding them engage in seeding, harvesting, distributing and selling, Zhang explained. He also referred to Korea’s farm co-op Nonghyup Agricultural Cooperative Federation, which plays a key role in defining Garak Market‘s characteristics. “Korea‘s well-devised farm product distribution system inspired me a lot,” said Zhang, recalling his past partnership with Korean distributors. 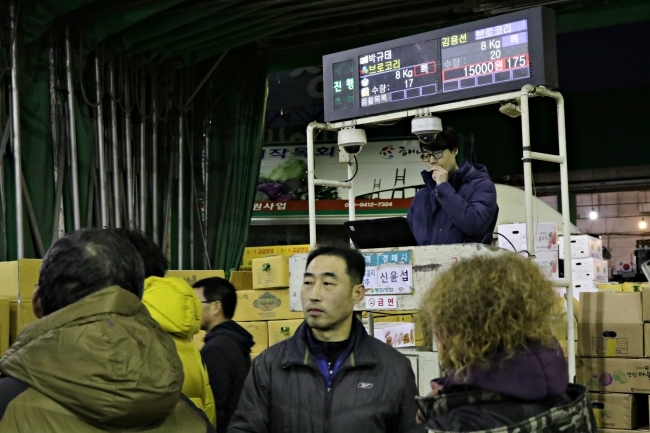 In addition, following example from Seoul Metropolitan Government‘s funds for Garak Market, Xinfadi Market advised Beijing’s local government to adopt and fund the product inspection system. After years of progress, the Chinese market is now striving for refurbishment, after seeing a drop in the volume of vegetable transactions for the first time in history. The move, starting next year, mainly aims to relocate sales stands according to the type of goods, and make use of the available 40 percent of floor space, according to the official. Zhang, a military veteran-turned-entrepreneur, laid the foundation for the concept of the market and transactions with Chinese farms in the wake of the end of government-led mandatory procurement. Xinfadi Market was founded in 1988, four years after the Family Production Responsibility System in 1984 allowed farmers to seal voluntary contracts with the government. "No one in China knew what the agricultural market looked like before 1984,” he recalled. 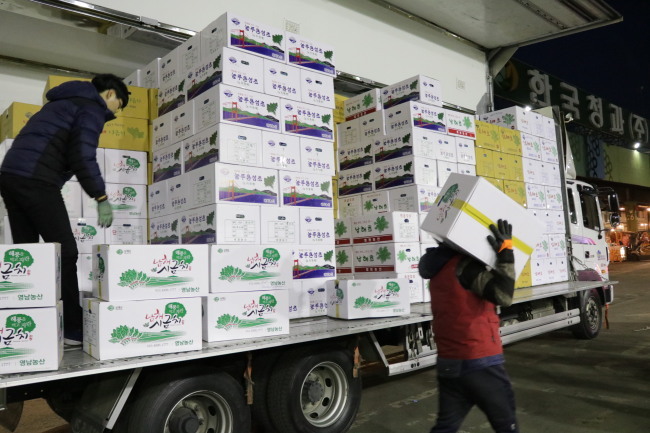 Meanwhile, Korea’s wholesaler, built on 543,500 square meters of floor space and run by the Seoul Agro-Fisheries & Food Corp., is now evolving into a new distribution system based on fixed-price contracts and private contracts, citing the need to quell price volatility. Since the market opened in 1985, the auction system was the backbone of the wholesaler‘s pursuit for fairness and transparency in trading. But a decade later, intermediaries boycotted the auction following a law revision to ban them from doing wholesale business, triggering a sudden shoot-up of agricultural product price in urban areas and plunge in rural areas. Korea also suffered a severe price fluctuation of cabbage in 2010, and of onion in 2013. Currently, out of the total transactions in Garak Market of 2.5 million tons, some 80 percent is made through auctions, while private contract-based trade takes up 20 percent, according to the market operator. The proportion of private contracts of farm products has gradually increased since a revision in 2012 enabled traders to make private negotiations with buyers. To meet consumers’ growing calls for price stabilization and embrace trade volume 1.7 times larger than its capacity, increasing free negotiations in the market should take precedence, Son Bong-hee, a spokesperson of the Garak Market operator, told reporters. “While under the auction system, a bidder who submits the highest price wins the product, so the price highly depends on the volume of a farm product’s daily supply,” he said. Son added the wholesaler is modeled after Ota Wholesale Market in Japan, which he said has managed to lower reliance on auctions to as low as 10 percent of the entire trade there. Another goal, he said, is to gradually increase transactions by intermediary companies instead of individual intermediary wholesalers, benchmarking European wholesale markets.